Welcome to the 2019 edition of Gino's Soccer Academy!! This is the 22nd year of our soccer program, during which time we have seen over 7,000 players in our Academy. 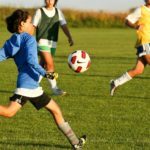 These players include competitive soccer players, recreational soccer players, teams, beginning and advanced players, and many who have gone on to play college soccer. Each year we look to improve our soccer academy, and have received a ton of positive feedback from parents and players about the quality of our program. Each year we see so many familiar faces returning to participate, along with a great mix of new players of all ages. We will continue to provide the best soccer experience for your player. Throughout the week players will get 1,000’s of touches on the ball and know that they will leave us on Friday a better, more knowledgeable, player than when they came to us on Monday. Gino's Soccer Academy is a week-long program for players ages 4 to 17. It is for the advanced as well as the beginning soccer player, individuals and teams. The camp format is built to accommodate and improve your skill level. Every day we will work on individual ball handling skills including dribbling, passing, receiving/1st touch, heading, shooting/finishing, and multiple moves to help you elude opposing players. Our emphasis is training you to be a better attacking player by building defensive pressure into our exercises. This will help to improve your touch on the ball and decision-making skills. Every day we will do Rondo’s (possession style soccer) and throughout the week incorporate team concepts such as combination play, switch of play, movement off the ball, 1v1’s, numbers up attacking exercises, along with teaching individual and team defending. We will also train you to play in different positions, and train many attacking concepts. We also want this to be a fun experience and will incorporate many skill building games that create great energy with the players! The morning sessions will work primarily on individual player development and small group play. We will build throughout the day with more small-sided games in the afternoon and end the day with a full-sided game. I was nicknamed ‘Gino’ as a young soccer player and it has stuck with me ever since. Over the past 39 years, I have played soccer at all levels including recreational, competitive, high school, college and professional soccer. My experience allows me to identify with players at any level. I currently hold my USSF National ‘B’ coaching license, and NSCAA Director of Coaching Diploma. I am the former Director of Coaching for the Walnut Creek Soccer Club and current Director of Coaching for Impact Soccer Club. I was also elected to our state soccer association (NorCal Premier Soccer) Board of Directors and work to elevate soccer in Northern California. My coaching background includes working for eight years as an NCAA Division 1 soccer coach at Saint Mary’s College (SMC) in Moraga, and two years working with the ODP Cal-North State Coaching Program. I have also been a Premier Level Coach for the Lamorinda and Walnut Creek Soccer Clubs, along with working as a trainer for various teams and individuals in other local clubs. I have many former players playing NCAA Division 1 college soccer and there is no better feeling than seeing a player achieve their goals and dreams of playing soccer at the highest level. I have worked at soccer camps for the past 27 years and I look forward to sharing my knowledge and experiences in the game of soccer with you.